"An apple a day keeps doctors away." Truly said. However, apple seeds contain a substance that can convert into poisonous hydrogen cyanide in the body. While the debate rage on over whether apples should be consumed whole- core seeds and all. Many people consider apple seeds are the healthy tuft(can be used in cancer treatment) and many out there believe apple seeds are more poisonous to health. Let's clear this confusion from your mind by this article. Apple seeds do contain some little toxic compound which produces Cyanide which is a lethal poison. If you eat whole apple seeds without crushing, they pass through your digestive system relatively unharmed. But if you chew the seeds thoroughly, you will be exposed to the chemicals inside the seeds, the amount you will be exposed is very small enough that your body can detoxify it easily. A single Apple's worth of seeds can't produce nearly enough cyanide in your belly to disturb your health. According to the Centers for Disease Control and Prevention, 1-2mg/kg is a fatal oral dose of Cyanide for154 lbs(70Kg) person. Someone has to chew finely about 200 apple seeds to experience fetal dose. 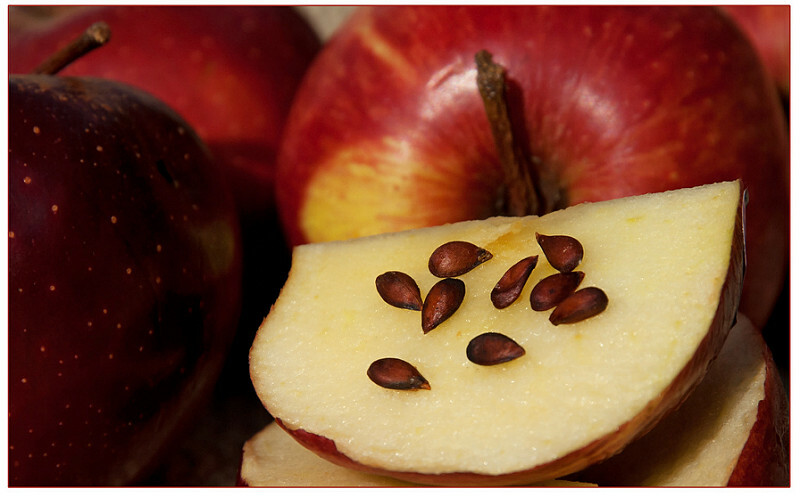 Toxic compound in apple seeds is Amygdalin( also called as Laetrile). Amygdalin is a cyanogenic glycoside chemical ingredient that has a property to produce a toxin called hydrogen cyanide by combining with the gastrointestinal enzyme. This same poison also called Cylon B which is been used during World War II. The main motto of this poison is to rob the blood cells which carry oxygen. Amygdalin is metabolized by the GI enzymes called betaglucosidase and forms benzaldehyde, glucose, and cyanide. A large amount of this poison is deadly and there is no antidote for this poison. Apple's are not the only fruits with cyanogenic glycoside either, peaches, apricot kernels, cherry pits- they've all got them. Amygdalin was first isolated in 1830. Amygdalin was first used as the cancer treatment in Russia in 1845 and later in the 1920's in the United States. It has been promoted as an alternative cancer treatment but studies have been found them to be clinically ineffective in the treatment. Then finally the promotion of laetrile to treat cancer described in the medical literature as a canonical example of quackery. Sign and symptoms associated with ingestion of significant amount of masticated pits or seeds containing amygdalin turn out to cyanide in belly include dyspnea, weakness, cyanosis, lightheadedness, trembling, restlessness, nausea, vomiting, and headache.The onset of symptoms is often delayed up to 2 hours or more after ingesting masticated pits or seeds that contain amygdalin. In severe cases, cyanide can cause severe difficulty breathing, coma, respiratory failure, low blood pressure, convulsions, lung damage or on the spot death. Since eating the apples with peels should be pesticide free. Apples are one of the most pesticide-contaminated fruit there is, you need to go organic. 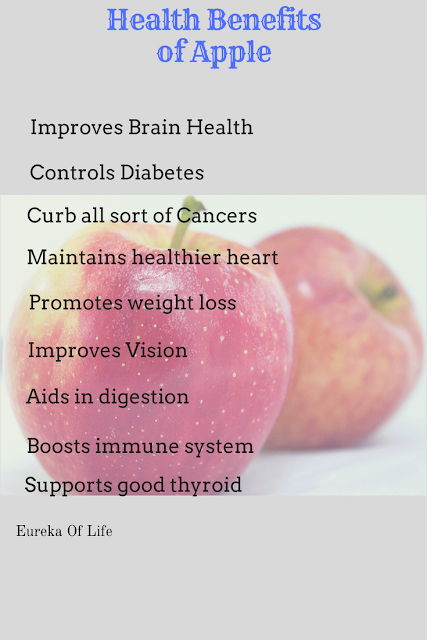 Furthermore, the extensive list of the health benefits that apples offer is hard to ignore. Improves Brain Health: Researchers from Center for Cellular Neurobiology showed that Apples have been proved to protect neuron cells against oxidative stress-induced neurotoxicity and reduces the risk of neurodegenerative disorders like Alzheimer's disease and Parkinson's disease. Controls Diabetes: Apples are loaded with soluble fibers, which is the key to blunting blood sugar swings. Also, the polyphenols lower glucose absorption in our digestive track. Right! Polyphenols stimulate the insulin receptors on cells throughout our body, which speeds up the removal of sugar from the bloodstream and gets it to our cells for metabolism. Eating an apple a day reduces 28 percent of chances to develop type 2 diabetes than those who don't eat apples. Curb all sort of Cancers: Scientists from the American Association for Cancer Research among others, agree that consumption of flavonol-rich apples could help your risk of developing pancreatic cancer by up to 23 percent. Apple peels have potent anti-growth activities against cancer cells in the liver. Maintains healthier heart: Research has shown highly soluble fiber intake reduces the build-up of cholesterol-rich plaque in arteries. This plaque build-up inside your arteries, it reduces blood flow to your heart and which can lead to coronary artery disease. Promotes weight loss: Aside from the normal ability of fibrous fruits to make us feel full and increase satiety, thereby reducing appetite and overeating, apples have another unexplained ability to help in weight loss. Studies have proved that apples actually speeds up the metabolism so that the additional calories consumed after eating an apple don't register in our body. Apple also a good source of biotin ( vitamin B7) that helps to break down the fats. Improves Vision: Apples are believed to make the eyes stronger and improves eyesight. Much of this is due to the fact that apples are rich in antioxidants phytonutrients and flavonoid compounds which also prevents the condition like cataract, macular degeneration, and glaucoma. Aids in digestion: Apples, being rich in fiber, helps in the digestive process. However, regular consumption of apples stimulates peristaltic motions so the muscles contract appropriately and move food along and ensure smooth bowel movements, prevention of constipation. Boosts immune system: Red Apple's peel contain an antioxidant called quercetin. This quercetin helps in boosting and fortifying immune power. Apples are known for improving immunity due to its Vitamin A and C content. Supports good thyroid: Thyroid gland is necessary for proper function of the body. Iodine content in apple is supporting good health of the thyroid gland. Surly next time while eating apple ur blog will strick my mind n will be carful not to consume the seeds. An apple a day keeps the doctor away . . .just forget about the seeds! seems like these tiny seeds look harmless but are really bad for the body.. Heads up to the apple lovers out there! Good info. I was not aware of this. Thank you for making aware.. I never knew such a shocking information especially from the apple seeds. Sometimes , we swallow those while we eat. Now i have got to be very careful in eating those. You made it good and thank you for bringing this up. I never knew apple seeds were dangerous to the health.I don't eat them but at least, I can caution those that eat them! I had no idea that apple seeds were poisonous! Thanks for all of the great information! This is really interesting. I wonder how many apple seeds you would have to consume for it to be harmful though? Thanks for debunking the myth that just consuming a few seeds from a single apple is harmful, as I imagine you would have to eat a lot to be poisoned. Interesting info although I don't plan on ingesting 200 apples in one sitting lol. But nonetheless this is good to know. I don't usually eat the seeds but it's good to be aware of those things. Thanks for sharing.